Partnering the local postmaster’s wife in a two-piano war-time concert effort, and Optical Surfaces Ltd., seems a far cry. But, there is a direct link. On the Lady’s shelf was a book on astronomy. This I borrowed, became very interested in the subject and consequently became a member of the British Astronomical Association. The President, a Mr. F.J. Hargreaves made astronomical mirrors in his spare time. I had a go at an 8-inch parabolic mirror, and became fascinated in the work. This was followed by a 12 inch mirror, which slid off the polisher onto a concrete floor whilst my back was turned, with disastrous results. The then Astronomer Royal, Sir Harold Spencer Jones, was aware of the excellence of Mr. Hargreave’s work, as did other professional astronomers, and suggested to him that there was a real need for such skill in full-time employment. “if your work interferes with your hobby, give up your work” to quote F.J. Hargreaves. So he planned to give up his work as a patent agent and start an optical company when the war was over. I heard of these plans and my offer to join him was accepted. A Mr. H.W. Cox, who was also an amateur optician (with his brother, he made the first Schmidt camera in this country) offered to join the company. Thus in 1947 the firm of Cox, Hargreaves & Thomas Ltd was founded, with “premises” in Coulsden, Surrey. Mr Cox never in fact became a member of the firm and I began work with Mr Hargreaves in 1950 after a year or so’s experience with the 200-inch telescope optics which were being made at the California Institute of Technology. The workshop behind the Brighton Road consisted of three garages which had been knocked into one, and had served as a surface air-raid shelter during the war after the walls and roof had been reinforced. 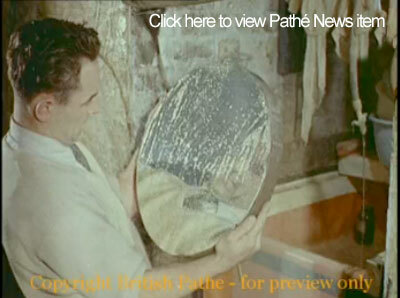 From such humble premises emerged a 50-inch diameter spherical mirror which went to the Mt. Stromlo Observatory, Australia, a 30-inch parabolic mirror for the newly mounted reflector at the Royal Greenwich Observatory, 24-inch and 27-inch diameter coelostat flats (the largest fused silica flats to be made in this country at the time) for the solar observatory in Rome and various other impressive optics. The need for temperature control was very obvious from the first, and in 1951 the Company took over the Tunnel Shelter underneath Cane Hill Hospital, where the optics for many medium-sized telescopes were completed, including a Schmidt system having a 47-inch primary mirror and a 32-inch corrector plate, made for the Royal Belgian Observatory. 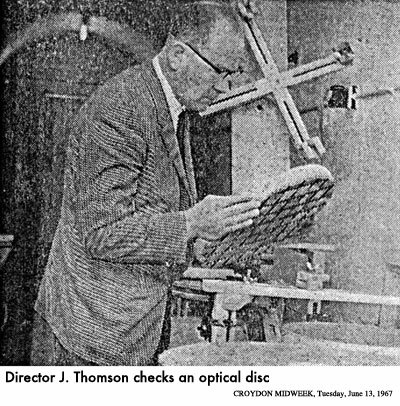 It was in 1955 that Mr. Mortleman joind the Company, having given up a promising career on guided missiles at fairy Avaiation Ltd. For the fascination of optical work. He willingly accepted a considerable reduction in salary as a result of his enthusiasm. True dedication indeed! He brought to the Company a freshness of attitude towards optical work, and contributed many original ideas in expertise. Being impatient to get a job done in the quickest time and still maintaining the specified accuracy, he developed new methods and devised short cuts to achieve this end. His best effort was to make a 28-inch spherical mirror for the University of Louvain in 9 days. This included doing all the polishing by hand, with the aid of an “oar” with which he “rowed” the full-size tool across the surface of the mirror. The University confirmed afterwards that the required tolerance of λ/10 had been more than met, their independent measures indicating errors of the order of λ/15 and λ/20. By 1961 it became obvious that the Company would never progress until radical changes were made in management, and proposals were made by J.M. and myself to the two other directors. These were rejected out of hand and we had no alternative but to leave the Company and set up in business on our own. A stained-glass window designer and manufacturer in Stoats Nest Road, Coulsdon was leaving the district and his property was up for sale. This was purchased by Mr. C.C. Mortleman from whom we rented the premises, set amongst a small apple orchard. Insufficient capital and long hours produced tools to make carpenters’ benches, thus enabling us to make machines on which to produce reference surfaces for testing our prospective customers’ components. Although the Company was formally founded on April 13th 1962, O.S. had in fact been in existence since early in the January, and had produced some optics and been paid for them before the formation date! They were busy days; the three founding Directors (the third was Jim Hysom, who had walked out of Cox, Hargreaves and Thomson Ltd “in sympathy”) spent all of their money and nearly all their waking lives getting the firm going. Very great help in the preparation of the workshops was given by one Jeff Spalding, a remarkable character who was then on a British Petroleum “Sandwich course”, and able to work with us during his vacations. He had and extraordinary knack for making hardware out of conversation, and once built twelve polishing machines singe-handed in a week. Unfortunately for O.S. he decided to stay with B.P. who – after all – could offer him glamour, money and security far in excess of the wildest dreams of O.S. Lucky B.P.! Considerable help came from other quarters in other ways (which was just as well, since there was a mini-recession in 1962, as a result of which much of the well-paid work we had counted on from Hilger & Watts failed to materialise). I have already mentioned Mr. C.C. Mortleman, who provided the Stoats Nest Road premises; another was Mr. Parsons of J. Pearson & Sons Ltd. N.16, who put sufficient work our way to enable us to enable us to keep going in those precarious early days. He also saw to it that we were paid promptly. Who can say that the firm would have survived its infancy without help such as this? In 1952, F. Twyman F.R.S., Technical Advisor to Hilger & Watts Ltd., had brought out an enlarged second edition of his textbook “Prism and Lens Making”. I was able to supply him with photographs I had taken of the 200-inch telescope optics in process of manufacture, together with a write-up of the work in the Institute’s optical shop, for inclusion in the new edition. He thought my collection of photographs would interest the head of their optical shops, and that was how I met Harry Yates, Hilger & Watts’ Optical Manager. Having no diamond milling equipment at Cox, Hargreaves & Thomson Ltd. We had been very grateful to Mr. Yates for getting this preparatory work done for us in Hilger & Watt’s shops. We in turn did sub-contract work for them in the form of “large” mirrors – anything from 6 to 16 inches diameter! Mr. Yates continued to carry out this work for us after Optical Surfaces had been founded, and O.S. carried on some of the sub-contract work from Hilgers, which was very helpful during our first two years’ trading. Mr. Yates continued to take an interest in our Company, and in the Autumn of 1963 he said to me – “Hey – do you know what – “ I replied “No – What?” His reply was “I’d like to join Optical Surfaces Ltd. Will you have me?” Of course the answer was “Yes”, and so the 18 – month old Company, with three founder directors and a crew of one, was joined by Mr. Yates – after 30 years with Hilger & Watts. The association was to prove mutually beneficial – O.S. was able to widen its range of products and acquired new techniques, while Mr. Yates learned at first hand the odd but effective machine methods which O.S. had developed, from its background in astronomical optics. Almost at once he was made a Director, in spite of his frequently expressed desire to become an ice-cream vendor! Relations with Hilger & Watts remained friendly until Charles Pataky joined us after answering our advertisement for an Optical Manager. There followed an estranged period, until eventually the rift was healed, and we found ourselves once more making 16 – inch Ebert Spectrograph mirrors and other optics for Hilgers. Shortly after Charles Pataky joined the Company, Jim Hysom left to start his own business in Luton, his home town. He had always been interested first, last and in the middle in astronomy, and was not very happy with the trend of production at that time. Optics for the amateur astronomical market had proved a hard way to earn a modest living, but nevertheless that was what Jim wanted, and Optical Surfaces was clearly not headed that way. In the outcome, it seems that Astronomical Equipment (Luton) Ltd, has provided him, and John Mathers who left us later for the same reasons, with the way of life which suits them. Happiness is indeed beyond price, and I for one hope that these two early pillars of O.S. have found it and will hang on to it. As a result of Jim Hysom’s leaving Charles Pataky was made a Director in September 1966. Since the days with Mr. hargreaves, we had appreciated the vital importance of constant temperature, and began to look for underground premises in 1962/63. We knew of the existence of the Riddlesdown Shelter and its suitability, but every approach to the “Powers that Be” resulted in a negative attitude, disinterest and a dozen and one reasons why we could not occupy the place. Our numbers were increasing at Stoats Nest Road, and the orchard had long gone, the area being occupied by two new buildings. The temperature in the polishing shop varied by as much as 15 degrees on a summer day, and optical testing became nigh impossible by the passing of some 750 trains per day within 50 yards of the eyepiece. 21/2 years of fruitless effort and search went by, during which time we had examined most underground areas in the surrounding countryside including Chislehurst Caves, hearth-stone workings outside Caterham, shelters under Epsom Down, brick works beyond Godstone, war-time underground emplacements beneath Reigate Hill, and many others. It was at this time that Mr. J.H. Stevenson came on the scene and began to take an interest in us in his role as Secretary of the National Association of British Manufacturers (now the Smaller Business Association Ltd.) he took up the cause on our behalf, with the result that the “Powers that Be” suddenly mellowed their attitude towards us, even showing enthusiasm towards our requirements. Thus in July 1966 we vacated Stoats Nest Road, and moved into our present premises, thanks to the ruggedness of Mr. Stevenson’s Irish powers of persuasion. Sometime ago we made a number of hexagonal plane mirrors and a 40 – inch paraboloid for Mr. Schofield’s project, under Professor Ring, at Imperial College, London. On his last visit Mr. Schofield was kind enough to let us see some star photographs he has taken with the finished instrument, showing an optical performance about 10 times better than required. This might sound as though we boobed in a sense, but in fact the mechanical mounting introduced greater errors than expected, and these were neatly compensated by the more-than-adequate optics. This may not be the way to make money – on the other hand, perhaps it is in these days of sloppiness – but it does make friends!